With insights gained from a lifetime of extreme adventuring, author and explorer David Miln Smith will share learning how to convert the fear of change from an enemy to an ally, and reframe risk from aversion to excitement. 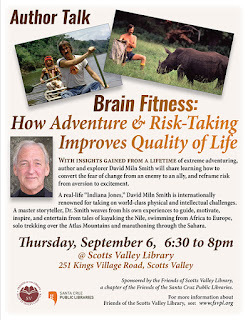 A real-life “Indiana Jones,” David Miln Smith is internationally renowned for taking on world-class physical and intellectual challenges. A master storyteller, Dr. Smith weaves from his own experiences to guide, motivate, inspire, and entertain from tales of kayaking the Nile, swimming from Africa to Europe, solo trekking over the Atlas Mountains and marathoning through the Sahara. Smith is the author of three books: HEALING JOURNEY: Odyssey of an Uncommon Athlete, The East/West Exercise Book, and HUG THE MONSTER: How to Embrace Your Fears and Live Your Dreams. He has also been featured on the cover of Sports Illustrated, Tri Athlete, New York Sunday Magazine, Signature, Running Times, and Good Times.